Welcome to COPD Canada’s "Letters to the editor" page. This page has been created to publish letters of interest, concern or suggestion from our members. We encourage discourse from our members and the Canadian COPD community at large. Letters are published as we receive them with little to no editing. Restrict the length of your letter to 500 words or less. We prefer that the letters be submitted by e-mail. Thank you. I belong to a group called the Take a Breath Singers, located at North Hamilton Community Health Centre 438 Hughson St. North, Hamilton, ON L8L 4N5 Our COPD Co-ordinator is Meridene Haynes and she is perfect for the job....we just love her. North Hamilton is a wonderful place.... they offer, among other things, a 10-week course entitled "Managing my COPD". The best part is that when you finish, they do not just shake your hand and send you on your merry way. They realize that people would go home with great intentions, and exercise for a few days, even weeks, but most would eventually quit, and fall back into their old ways. So, they offer access to exercise programs (with not a penny of funding) access to a group that meets weekly for 2 1/2 hours called the "Take A Breath Social Group" for social and information. We have even formed a (voluntary) singing group who go out into the community and sing for free, and this gets the message out that there is life after COPD diagnosis. We have about 30-40 members in our social group, and the TAB Singers consists of between 20 to 25. Great exercise for the lungs, and we have so much fun and laughter...except when one of the group is ill, and/or passes away. We consider ourselves a "family", and when one hurts, we all hurt. We just lost one of our founding members 3 days ago, and we will, of course, sing at his funeral, as we have done for several others (including one fellow we did not know, whose family requested we sing). Sorry to go on so long, but TAB is just such a great place, with so many resources, that I can't say enough about it. I wanted to share my COPD story. My name is Larry and I am going to be 68 years old this year. I smoked for over 50 years. When I was 60 I was diagnosed with COPD. I did three breath tests and failed them. I had to stop for breath when walking up stairs. I was put on two puffers. Around the same time, I got involved in Childhood Cancer Awareness and realized no one is going to listen to me when I had a smoke hanging out of my mouth. My daughter and a grand niece were also instrumental in my decision to quit. I quit cold turkey and I guess because I wanted it so bad quitting was easy. I started walking and riding a bike and kept that up. After a year and a half, I signed up for a 10km run for Childhood cancer (OOCH). I mostly walked and jogged and had to stop a few times to catch my breath but I finished. I kept up with my riding and walking and the following year I signed up for a few runs and by years end I could jog and walk an entire 10 km run. On the third year on my first 10 km i was able to jog a complete ten km so I started signing up for more. That year I did 10 events including a half marathon in Toronto and which I did have to walk a few times but again my mission was to finish and I did. The following year I did 10 events including a triathlon. 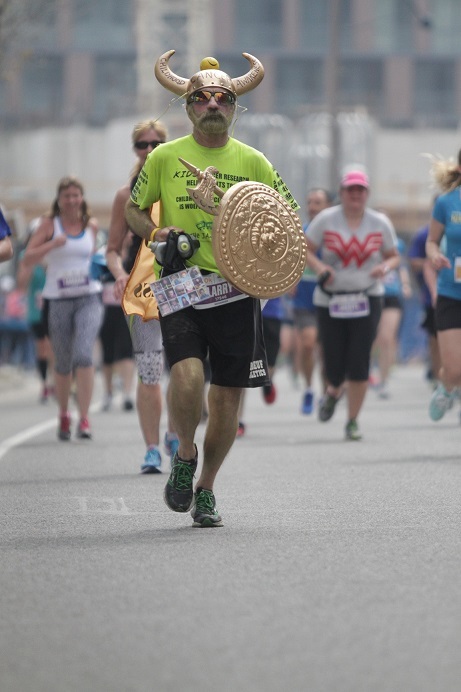 It was that year I started running in costume and started what is now how I finish a run. I run as hard as I can as I approach the finish line and I take my water pack off which has a picture of 15 cancer children. I stop at the finish line and kiss the picture and it crosses the finish line first. I have never beaten the children. Along with runs I did a 100km bike challenge for Childhood cancer in June. In 2016, I rode 1080 km for this challenge. In 2017, I am planning on beating that number. COPD was a wake-up call. A call I am glad that I answered. I refused to let COPD stop me from doing things in my bucket list. I share my COPD news letter and information to a couple of friends with COPD. They have a different outlook on living with COPD and choose to continue to smoke and get by with puffers. When I was told my lungs would never get better I could not and did not accept that. My road was not an easy one and I could have just given in but with each improvement I embraced it and fought for more. I hope my story may help others with COPD by letting them know there could be light at the end of the tunnel. I spoke with you last spring and since have subscribed to the COPD newsletter. I had mentioned to you about a mask for people to wear in cold weather and will bring it up again. I see nothing in the newsletter which suggests anything to deal with cold weather other than stay out. With this mask, most people who don’t have too many mobility issues can go out in cold weather and do the things they normally do. I was diagnosed in 2010 and found wearing a scarf was prohibitive. I did some research and after meeting someone who used the mask for riding bikes in winter, I purchased one. Now I use one from a different company but it serves the purpose. For me when the temperature is below 0 I cannot stay outside long without it affecting me. With the mask, I can shovel snow at –35 C. for 2 hours. I have done this. Considering there are no side effects whatsoever I wonder why something like this is not promoted. All medications to counteract the effects of the result of cold weather have side effects. This mask does not. So..... what can you do to get the powers above to do something simple and start recommending something which allows anyone with COPD to have some normalcy to their life? I find this sooooo frustrating. No one listens to something so simple. I spoke with you yesterday about flooring and COPD. Also, you may remember my brief words on the cold avenger face mask. I am registered as a member and scanned a lot of the available bits of information for members...and there is a lot. What I find missing is what do to protect oneself from the cold environment other than remaining in one’s residence. I found nothing other than a clip of someone wrapping a scarf around herself which implies that is a good way to do that. Lots of discussion about what cold does. Most of us know the physical consequences of cold through experience. Why is there nothing specifically related to that type of protection? If I sound frustrated it is because I am. I see too many people who stay indoors, avoiding having a more active life, because they cannot stand the cold. I have found this mask that I mentioned to be a source of freedom for me. I cannot be outside for long in below 0 temperatures but with the mask can be outdoors at –30 to -35 for long periods. So far my max has been 2.5 hours. I have spoken with the owners of the mask company and they stated that a lot of people with COPD use it, but they cannot advertise it in that respect as it is not a proven medical device. It is used for extreme winter sports. I have spoken with people in my city about this and always run into the excuse of not being able to endorse such a product. I find this so, so unproductive/ unhelpful. Why can’t there be a way to get around this to enable people with COPD the option of having such a product. Less, colds, less exacerbations, less hospitalizations. To me it’s a no brainer. Nothing negative about this particular mask other than the cost which is $59 American. needed to sound off about this. I feel free with the mask and am able to do what I did pre COPD times. All COPD patients should have this opportunity. I didn’t know who to contact about this other than you. You may forward this email to any one you wish. It may help make such a product as the one I purchased available to everyone through information sharing. By the way, I get nothing out of this other than knowing that maybe more COPD patients are able to have more freedom living with this condition. I must apologize for the length of this email, but couldn’t see how to condense it. If you or anyone else wish to contact me I would appreciate it. Thank you. I am 78 years old, and was diagnosed with bronchiectasis when I was 15, and always find the newsletters interesting. There was a short piece about insomnia, which prompted me to share this. For years, I’d wake up during the night and not get back to sleep again. My solution was to get up for an hour or two until I felt sleepy and then go back to bed. I lost two hours a day this way. Then I came across a book in a thrift store called "I Can Make you Sleep", so I spent my one dollar. I didn't have any real expectations it would help, having tried everything. But Eventually I opened it and saw there was a hypnosis CD Inside. I started to play the CD, lasting 23 mins, on a personal CD player with ear bud in one ear, as I sleep on my side, and when I woke up in the night. Very soon I started to improve. Paul McKenna, the hypnotist, says he programs your mind to make you sleep. After a few months of using this pleasantly soothing CD, I can honestly say I sleep through the night. I sometimes get up to go to the bathroom but go back to sleep. On rare occasions, I need to play it more than once. I have now been insomnia free for well over a year. I want to tell everyone there's no need for insomnia. I showed the book to my doctor. she copied the dust jacket and said it was great that I found a drug free solution. I have no personal knowledge of this man, and no financial interest. I googled his name and found Paul McKenna has an impressive resume. I don't know him personally, just a desire to share my experience in overcoming insomnia.